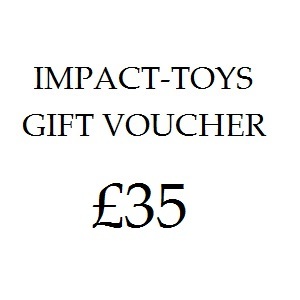 A £35 gift voucher to spend on any of the toys on Impact-Toys.com. It can also be redeemed against postage costs. When you buy this voucher, we will generate a coupon of equal value and you will receive this coupon via e-mail. Please make sure that the e-mail address you use when purchasing this item is valid and that you check your junk folder if you have not received your coupon within 48 hours. If a purchase is made that is less than the value of the voucher, we will issue an additional coupon for the remaining value that can be used at a later date. Please note that these vouchers and the subsequent coupons can not be redeemed for cash (either physical or electronic), they are only usable against products on Impact-Toys.com. The coupon generated by this voucher can be used by anyone but is only valid once. Be the first to review “£35 Gift Voucher” Click here to cancel reply.